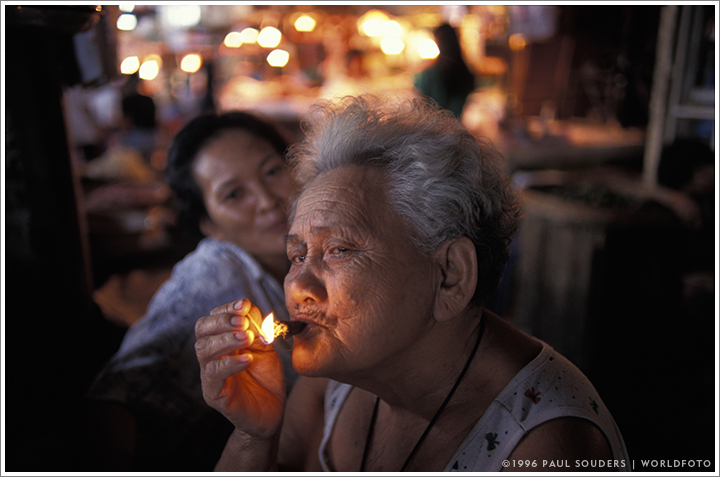 Portrait of an elderly woman lighting up a cigar inside the Carbon Market along Cebu City’s waterfront. Photographed February 4, 1996 with a Nikon F3 camera and 28mm f/1.4 lens on Fujichrome 100 slide film. This entry was posted on Sunday, February 4th, 1996 at 7:18 am. It is filed under On the Road and tagged with Asia, Philippines, Portraits, Street Scenes. You can follow any responses to this entry through the RSS 2.0 feed.